A new exhibit has opened in Samford University’s Art Gallery. Now through Nov. 18, photographer Caroline Summers is showing her audio/visual exhibit at Samford. Summers is Samford’s director of photographic services. 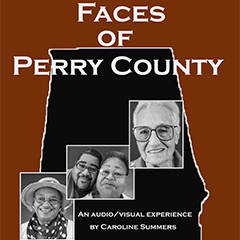 The exhibit, “Faces of Perry County,” features 18 portraits of Perry County residents alongside audio of the subject telling their story. One gets the opportunity to slow down, sit across from the portrait and listen to the experiences of others. “We encourage those to come out, find a portrait they might connect with, and hopefully realize how important people’s lives are through their stories,” said Robin Snyder, assistant professor of art and gallery director. Perry County in central Alabama is the birthplace of Samford University, but it is also known as one of the poorest areas in the United States. Summers said the purpose of the exhibit is to highlight the community and their generosity despite their negative statistic. The photography is simple to move past distractions and stereotypes, so that one is forced to focus on the individuals. “The people of Perry County offer an appreciation for life and the gifts God has given us. This exhibit demands you slow down and appreciate what they have to offer,” Summers added. The exhibit requires a smart phone to listen to audio, although there will be an MP3 player and assistance if needed. There will also be an opening reception honoring Summers and the exhibit Oct. 8 from 4-6 p.m., with an artist talk at 5 p.m. Regular gallery hours are 9 a.m. to 4 p.m. Monday-Friday. The gallery is located in Swearingen Hall.